13. April is Water Awareness Month! 17. Why do automakers support climate rollbacks? 23. Global Science Communication Intern, World Wildlife Fund, Washington, D.C.
(Friday, April 6, 2018) Jonathan Russo will present his scientific paper Predicting Participation in the Las Vegas Water Smart Landscaping (WSL) Program. Faculty, students and the general public are invited. At 2:00 p.m. in room 481, Wrigley Hall, Arizona State University, Tempe campus. More information. (Friday-Sunday, April 6-8, 2018) Each year Human Rights at ASU sponsors a film festival to engage ASU and the greater community in a discussion of human rights issues through film. This year’s three-day festival will be held April 6-8. Admission is free and refreshments will be available. All sessions will be held at College Avenue Commons Auditorium on the Tempe campus. More information and schedule. 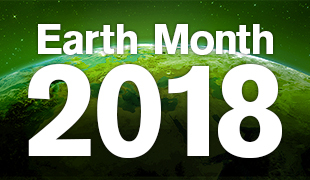 (Saturday, April 7, 2018) Celebrate Earth Day 2018 by helping to restore walking and hiking trails on "A" Mountain, Tempe's only preserve. Let's walk the talk and give back to the Mountain we love too well! Check in at 8:30 a.m., 9:00-11:30 a.m. work, and 11:30 a.m. lunch. More information on location and registration. (Tuesday, April 10, 2018) Marley Halter will present her scientific paper Transformation Labs as a Sustainability Intervention to Leverage the Human Factor of Social-Ecological Change in the Escalante Community Garden. Faculty, students and the general public are invited. At 9:00 a.m. in room 401, Wrigley Hall, Arizona State University, Tempe campus. More information. (Wednesday, April 11, 2018) Eleanor Rauh will present her scientific paper Public Perceptions of Transformational Strategies for Water Sustainability Transitions: A Multi-City Survey in the Western U.S. Faculty, students and the general public are invited. At 9:00 a.m. in room 323, Wrigley Hall, Arizona State University, Tempe campus. More information. Sustainability Series: Livestock: Cause of or Cure for Land Degradation? (Wednesday, April 11, 2018) Cathy Waters, NSW Department of Primary Industries will present Livestock: Cause of or Cure for Land Degradation? From 12:00-1:15 p.m. in room 481, Wrigley Hall, Arizona State University, Tempe campus. More information and registration. (Wednesday, April 11, 2018) Come and learn about how I-Corps™ participating teams go through an assumption/hypothesis-testing, customer-focused discovery process to gather important insights needed to maximize the impact of their innovations. Using Lean Startup methodology, teams are urged “out of the classroom” to conduct interviews, study customer/stakeholder needs, collect feedback, and find partnership opportunities. From 12:00-2:00 p.m. in room 401, Wrigley Hall, Arizona State University, Tempe campus. More information and registration. (Thursday, April 12, 2018) Join us for this networking breakfast and panel discussion event about the connections between housing and health in the Valley. From 8:30-11:00 a.m. at the Mountain Park Health Center, 1840 E. Broadway Rd, Tempe, AZ. More information and registration. (Thursday-Saturday, April 12-14, 2018) Attendees will have the opportunity to meet and network with a diverse set of global stakeholders, share their research through talks and posters, engage early with an up and coming initiative, and help shape the objectives and direction of Global Locust Initiative. More information and registration. (Monday, April 16, 2018) This is the first webinar in the new series and focuses on climate policy. Panelists include Michael McCormick, California Governor’s Office of Planning and Research, Guy Williams, on the Detroit Climate Action Plan and Liz Williams Russell with the Foundation for Louisiana. This session will be moderated by Elizabeth Graffy, Professor of Practice at the Arizona State University's Center for Science, Policy & Outcomes and a Senior Sustainability Scientist at the Julie Ann Wrigley Global Institute of Sustainability. The webinar will be from 10:15-11:45 a.m. MST. More information and registration. (Wednesday, April 18, 2018) Sechindra Vallury will defend his PhD prospectus Institutions for Provision of Shared Infrastructure: Insights from Irrigation Systems in India. Faculty, students and the general public are invited. At 9:00 a.m. in room 481, Wrigley Hall, Arizona State University, Tempe campus. More information. (Wednesday, April 18, 2018) Across the country, people who depend on winter for their livelihoods are feeling the heat. On the sidelines of ski and snowboard slopes, an epic struggle to reverse rising temperatures is unfolding. Ski towns and the snow sports industry are paving the way towards a clean energy future. Doors open at 6:30 p.m.; showtime at 7:00 p.m. at Harkins Valley Art Theatre, 509 S. Mill Ave, Tempe, AZ. More information and registration. (Thursday, April 19, 2018) Come and learn about how I-Corps™ participating teams go through an assumption/hypothesis-testing, customer-focused discovery process to gather important insights needed to maximize the impact of their innovations. Using Lean Startup methodology, teams are urged “out of the classroom” to conduct interviews, study customer/stakeholder needs, collect feedback, and find partnership opportunities. From 12:00-2:00 p.m. in room 401, Wrigley Hall, Arizona State University, Tempe campus. More information and registration. (Friday, April 6, 2018) Formerly the annual Outreach & Engagement luncheon, the purpose of this event is to coalesce a network of community-engaged faculty and staff from all ASU academic and administrative units to share strategies for forging meaningful and mutually beneficial partnerships with the community. There are several breakout sessions. Registration, networking, and a light breakfast will be available beginning at 8:00 a.m. All community-engaged faculty and staff at Arizona State University are invited to attend the 2018 Social Embeddedness Network Conference from 9:00 a.m.-4:00 p.m. at the La Sala Ballroom, Arizona State University, West campus. Registration. Questions, contact Lindsey.Beagley@asu.edu (Director of Social Embeddedness) or Danyel.Chleborad@asu.edu (ASU Event Coordinator). (Friday, April 6, 2018) Jos Lender, Advanced Materials, Advanced Functional Materials and Advanced Optical Materials will present Publishing Advanced Material Science – How to Maximize Your Success at 10:45 a.m. in room 150, Schwada Classroom Office Building, Arizona State University, Tempe campus. Contact Durella.ODonnell@asu.edu for more information. (Friday, April 6, 2018) Yan-Yan Hu, Florida State University will present Insights into Fast Ion Conductors from Solid-State-NMR/MRI at 12:15 p.m. in room 150, Schwada Classroom Office Building, Arizona State University, Tempe campus. Contact Durella.ODonnell@asu.edu for more information. (Friday, April 6, 2018) Jens J. Kuhn, National Institute of Health, National Institute of Allergy and Infectious Diseases, Integrated Research Facility at Fort Detrick will present Ebola: An Example of Fake News, Trickery, Imperialism and Other Pitfalls Penetrating Science from 12:00-1:00 p.m. in the Auditorium, Biodesign Institute, Arizona State University, Tempe campus. More information. (Friday, April 6, 2018) Katelyn Cooper, LEAP Scholars, will present Toward More Inclusive Large-Enrollment Undergraduate Biology Classrooms: Identifying Inequities and Possible Underlying Mechanisms from 1:00-2:00 p.m. in room 106, E-Wing, School of Life Sciences, Arizona State University, Tempe campus. More information. (Friday, April 6, 2018) Janos Pasztor, Executive Director, Carnegie Initiative for Geoengineering Governance (C2G2) will present Participatory Governance on a Warming Planet: Why Climate Choices are About People, Not Technology from 6:30-8:00 p.m. in the Marston Theater, ISTB-4, Arizona State University, Tempe campus. This presentation is co-sponsored the School for the Future of Innovation in Society and LightWorks®. More information and registration. (Monday, April 9, 2018) Vaughn Cooper, University of Pittsburgh will present Toward Translational Evolutionary Microbiology using the Lens of Genomics from 11:45 a.m.-1:15 p.m. in the Auditorium, Biodesign Institute, Arizona State University, Tempe campus. More information. (Tuesday, April 10, 2018) Alexander MacDonald, Office of the Administrator, NASA will present The Long Space Age and the Future of Space Exploration from 12:00-1:15 p.m. in room 207 (Gold), Memorial Union, Arizona State University, Tempe campus. More information and registration. (Tuesday, April 10, 2018) Bruno Kaufmann, Global Forum on Modern Direct Democracy will present Is Democracy Really in Decline? A Report Back from a 200-day Trip Around the World from 2:00-3:30 p.m. in room 880N, University Center, Arizona State University, Downtown Phoenix campus. More information. (Thursday, April 12, 2018) Anthony Hatch, sociologist and author will present Overdose: Institutional Addiction in the U.S. Custodial State as the keynote to the 2018 IHR Fellows Symposium from 4:30-6:0 p.m. (4:00-4:30 reception) in the West Hall Secret Garden, 1000 S Cady Mall, Arizona State University, Tempe campus. More information and RSVP. (Friday, April 13, 2018) What is health and what is disease? What institutions generate or impede health? Who has access to the healthiest environments and what makes those environments healthy? How do communities construct, maintain or discipline health in individual bodies? This questions will be discussed at the Symposium from 8:30 a.m.-3:30 p.m. in room 135, West Hall, Arizona State University, Tempe campus. Free and open to the public but please RSVP. More information and RSVP. (Friday, April 13, 2018) Christy Spackman, Harvey Mudd College will present In Smell’s Shadow: Materials and Politics at the Edge of Perception from 12:00-1:30 p.m. in room 5536 Coor Hall, Arizona State University, Tempe campus. More information and registration. (Friday, April 13, 2018) David Hu, Georgia Institute of Technology, will present Fire Ants Build a Raft in Two Minutes, Grubs Eat a Pizza in Two Hours at 10:45 a.m. in room 150, Schwada Classroom Office Building, Arizona State University, Tempe campus. Contact Durella.ODonnell@asu.edu for more information. (Wednesday, April 18, 2018) Arizona State University’s Zero Waste Department partners with Post-Landfill Action Network to hold a Points of Intervention Fair. From 11:00 a.m.-2:00 p.m. on Hayden Lawn, Arizona State University, Tempe campus. More information. (Wednesday, April 18, 2018) ASU’s Zero Waste Department partners with Post-Landfill Action Network to hold a speaker series featuring changemakers from around the country. From 5:00-6:30 p.m. in room 202 (Alumni Lounge), Memorial Union, Arizona State University. More information and RSVP. (Saturday, April 7, 2018) Gould Evans + Canary invites you to a presentation by Gil Penalosa, founder of 8/80 Cities, and a discussion on creating a vibrant city and healthy community for everyone. From 9:00-10:30 a.m. at Gould Evans + Canary, 521 S 3rd St, Phoenix. More information and registration. (Saturday, April 7, 2018) CycloMesa is in its sixth event season in 2018. Get ready to enjoy all things bicycle on Saturday, April 7 2018 at the Mesa Convention Center. Saturday’s festival compliments the start/finish line of El Tour de Mesa, a metric century ride and the sister ride to the famous El Tour de Tucson. From 9:00 a.m.-1:00 p.m. in Mesa. More information. (Tuesday-Friday, April 10-13, 2018) We are bringing together world-renowned dryland experts, numerical modelers, and remote sensors to directly assess and refine a framework for understanding how precipitation and soil moisture drive plant community composition, productivity, soil respiration, and coupled biogeochemical cycles. To be held at We-Ko-Pa Resort and Conference Center, 10438 N Fort McDowell Rd, Fort McDowell, AZ. More information. (Tuesday, April 10, 2018) Lisa McKnight, Salmon, Lewis & Weldon PLC will present Inside the Legalities of the Endangered Species Act from 7:00-9:00 p.m. (Doors open at 6:30 p.m.) At the Southeast Regional Library, 775 N Greenfield Rd, Gilbert. More information. (Thursday, April 12, 2018) Bea Johnson, zero waste expert will show you how to live a zero waste lifestyle. From 6:00-8:30 p.m. at the Arizona Jewish Historical Society, 122 E Culver St, Phoenix. More information and registration. (Thursdays, April 12, 19, and 26, 2018) Advanced Smartscape Irrigation builds upon the basic Smartscape course by offering in-depth training for landscape professionals on the design, installation, maintenance, and management of drip and sprinkler irrigation systems. The course stresses irrigation efficiency and wise water use in turf and landscapes. To be held from 1:00-6:00 p.m. at the University of Arizona Cooperative Extension Service, Maricopa County, 4341 E Broadway Rd, Phoenix. For more information and registration contact Kirti Mathura at Smartscape@cals.arizona.edu. (Saturday, April 14, 2018) March for Science Phoenix is a diverse, nonpartisan group that defends and celebrates publicly funded and publicly accessible science as a foundation of American freedom and prosperity. We believe that the best way to protect the integrity of evidence and enact sound policy in our state is by encouraging the public to value and invest in science. Join us on for a rally, march, and science expo starting at 10:00 a.m. until 2:00 p.m. at Margaret T. Hance Park. Speakers will include Dr. Sethuraman "Panch" Panchanathan, Executive Vice President and Chief Research and Innovation Officer of Knowledge Enterprise Development at ASU and Mayor Greg Stanton of Phoenix among others. More information. (Tuesday, April 17, 2018) Local reuse organization, Stardust Building Supplies, will give us an inside look into the process of building material reuse from the first steps of deconstruction and reclamation to how individuals transform their homes with salvaged materials. A warehouse tour will be a part of the event. Sensible shoes are recommended for this tour. From 11:30 a.m.-1:30 p.m. at Stardust Building Supplies, 1720 E Broadway, Mesa. More information and registration. Tragic history was made recently in Tempe when a self-driving car hit and killed a human being for the first time. One person is killed per 100 million miles driven in the United States. “With regard for autonomous vehicles, we are at one death for ten million miles,” said Clark Miller, professor in the School for the Future of Innovation in Society and moderator of an Arizona State University panel discussion Friday. The panel, "The Future of Autonomous Vehicles," addressed the accident and its implications. Read more. Drought, and an imbalance between water demand and supply, continues to plague the Southwest. Arizona's main source of water, the Colorado River, on which 2 million jobs in the state and over $100 billion in labor income are dependent annually, is threatened. Water management is front and center in current discussions in Arizona's state capital, and the recent 2018 State of Green Business report revealed an opportunity for businesses to do more about water within their operations, supply chains and beyond. Read more. Most people go to college to broaden their horizons. U.S. Air Force veteran Christopher Ames went back to Arizona State University with a laser focus to solve one particular problem. Read more. Ford, GM and Toyota have been touting their climate concern. Is it hype or hypocrisy? Read more. To provide career training opportunities and support operational services, the NOAA/National Weather Service (NWS) Weather Forecast Office (WFO) in Phoenix, AZ maintains a volunteer program for upper class undergraduate/graduate meteorology students and recent graduates. To qualify, applicants must be an undergraduate student entering their junior or senior year or graduate student in good academic standing or a recent graduate (within the past six months). Applicants must be pursuing or have a degree in meteorology that meets the U.S. Government Series 1340 requirements (available at https://goo.gl/BLoh0J). All volunteers are subject to a mandatory security background check. This position is unpaid. The student will: develop an understanding of the culture, responsibilities, and services of the WFO; complete operational training; assist the WFO in providing operational services to its customers; complete a research project that benefits the student and WFO; receive career counseling. Current students may elect to receive credit for the volunteer program and should consult with appropriate university officials. The volunteer program will begin approximately 4 June 2018 and continue through early September 2018 to coincide with the North American Monsoon. Students are expected to volunteer for 4 hours (4 PM to 8 PM) per office visit and 80+ hours through the summer. The selection process will be competitive. Applicants must submit 1) a resume, 2) a single-page cover letter expressing what attributes/skills they bring and what they hope to achieve from the program, 3) unofficial transcripts, and 4) one letter of reference (academic). Approximately 2-4 volunteers will be selected. Applications Due Friday 13 April 2018; Selections Made by Friday 27 April 2018. Send applications and questions to: Paul.Iniguez@noaa.gov. For the 2018-19 academic year, the University of Arizona Sky School will be offering graduate fellowships for open Sky School instructor positions. ASU graduate students are eligible and encouraged to apply. The fellowships are designed to connect graduate students with K-12 students as research mentors and educators during residential or daytime educational programs. The fellowship is a unique opportunity to gain experience with science education and communication. Sky School staff will provide training for effective mentoring of students. Instructors will mentor groups of K-12 students on 1-4 day programs throughout the year at our Mt Lemmon campus or at schools in the Tucson area. Programs include instruction on general themes relevant to sciences in the sky island region-ecology, geology, hydrology, dendrochronology, soil science, astronomy, culture, and history-as well as opportunities for students to conduct inquiry projects on topics of their choice. Sky School staff will provide feedback to instructors on improving their facilitation and teaching skills. This is a new partnership between ASU and UA. Dr. Benjamin Blonder (bblonder@asu.edu) is the Sky School science coordinator and also ASU School of Life Sciences faculty member. He can answer any questions regarding the program, eligibility, or time commitment. Deadline extended to April 20, 2018. More information. February2018 drought summary is online. CLIMAS Podcast: February 2018 - Realistic Expectations for Clawing Back to Normal Precip in a La Niña Winter? Prospects for a Miracle March? Go to ASU Jobs and search for job requisition 40631BR. Closes April 12, 2018. Application closing date is April 9, 2018. More information. Application deadline April 8, 2018. More information. Review of applications begins April 9, 2018. More information. Senior Climate Change Specialist, The World Bank, Washington, D.C. Application deadline April 12, 2018. More information. Application deadline April 13, 2018. More information. Application deadline April 15, 2018. More information. Inspire4Nature is a PhD training network at the interface between the science and the policy of international biodiversity conservation, funded by the EU Horizon2020 Marie Skłodowska-Curie Actions. They are now recruiting 15 PhD positions - each one of them in collaboration with one (or more) leading international conservation organizations. Deadline: April 16, 2018. More information.